Nine drum corps from the World, Open and All-Age divisions came together for a rousing night of competition and entertainment June 27 at the Drum Beauty DCI Tour event in Stillwater, Minn. Taking the field that clear Sunday night were the Cavaliers, Cadets, Blue Stars, Madison Scouts, Colts and Colt Cadets, Minnesota Brass, Govenaires and Racine Scouts. 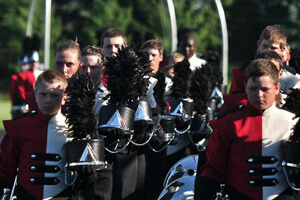 The Cadets clinched the top spot in World Class, with Colt Cadets winning in Open Class and Minnesota Brass leading the contest in the All-Age category. More than 35 years in the making, the Drum Beauty contest in Minnesota is one of the longest-running annual events on DCI Summer Tour schedule. View this photo gallery.